What’s the most Christmasy thing you can imagine? Is it Santa eating a candy cane in an ugly Christmas sweater while delivering presents and watching A Charlie Brown Christmas on his phone? That’s cute, but that ain’t it. The most Christmasy thing ever are the 80+ Miracle Pop-Up locations around the country, as they feature floor-to-ceiling decorations, Christmas-themed booze, and holiday cheer out the wazoo. Miracle Pop-Up is a chain of Christmas bars, but all the bars have different owners and… it’s a pretty unique thing. To get the lowdown, we spoke to Joann Spiegel, who’s been working with Miracle Pop-Up for four years -- and helped create their cocktail programs. Here are the answers to all your burning questions about the Miracle Pop-Up Christmas bars. What the hell is a Miracle Pop-Up? It’s a Christmas concept that takes over bars across the country in November and December. Take a look at the locations this year and you’ll notice the names of existing bars that are getting complete makeovers -- from the decor to the drink menu -- to become a Miracle Pop-Up. And they’re growing like crazy. “The first season [in 2015], we had 17 partners, followed by 52 last year, and between the Miracle and Sipping Santa bars, we have 94 this year,” Spiegel says. Oh geez, what’s Sipping Santa? 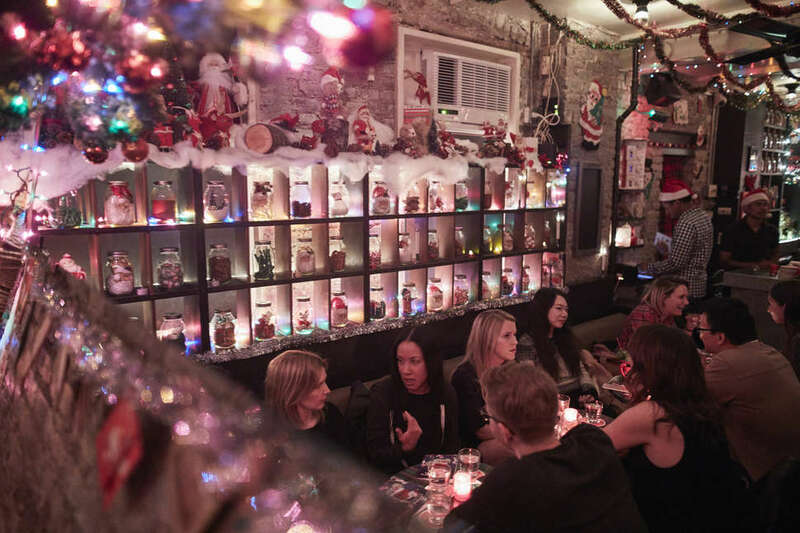 It’s a special Christmas bar takeover for select tiki bars needing a little Xmas spirit. Look at how they manage to absolutely nail a surfing + Christmas vibe all at once. Back to the Miracle Pop-Up -- how did this thing start? At the end of 2014, Greg Boehm owned a bar in New York City that was under construction. It wasn’t ready to open yet, and the place was a mess. Also, it was tough for his staff to make money because they weren’t working. Why should you go to one of these Miracle bars? Each bar hosting the pop-up is (mostly) owned by someone different, so the decor changes from bar to bar, but the original in NYC has garland everywhere (and hanging Stars of David, because everyone is welcome! ), presents hanging from the ceiling, Xmas-colored lights on every surface, and more pictures of Santa than seems healthy! They’re really into Santa. Are the cocktails any good? Uh, yeah. Spiegel helps develop these cocktails, and she used to be behind the bar at NYC’s The Dead Rabbit, one of the best bars in the world. 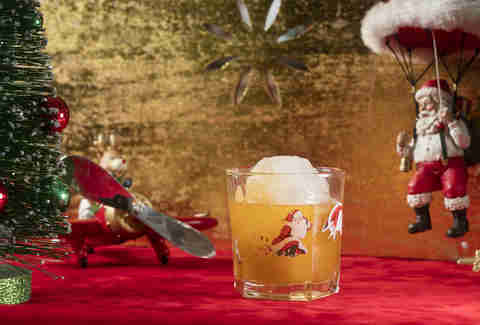 She builds the cocktails around Christmas flavors, but they’re more inventive than you might think. You’ll find drinks like a Snowball Old Fashioned with gingerbread bourbon, wormwood bitters, lemon zest, and an actual dang snowball inside the glass. Egg nog lovers will enjoy the Jingle Balls Nog with cognac, sherry, brown butter, cinnamon, almond milk, cream, sugar, egg, and nutmeg. The NYC location sold 2000+ last year! There’s also takes on holiday punch, the beautifully named Yippie Ki Yay Mother F****r! with sweet potato Barbados rum and marshmallow orgeat, and the Christmapolitan with vodka, elderflower, and spiced cranberry sauce. If these bars are so successful, why aren’t they open year round? “I would imagine it’d get a bit stale,” Spiegel notes. Duly noted! Get thee to a Miracle Pop-Up before they close down for the year! Some locations shut down after Xmas Eve, and some stay open through the last week of the year. Be sure to check with the location near you for specific dates -- and also find out if you can make a reservation! Most bars do a mix of walk-in and reservation to ensure you won’t have dudes in ugly Christmas sweaters breathing down your neck as you try to enjoy a Snowball Old Fashioned. OK, give me one more good reason to go to one of these Christmas bars. Lee Breslouer is a freelance writer based in Colorado, where he often partakes in some of the country's best beers and mountains.